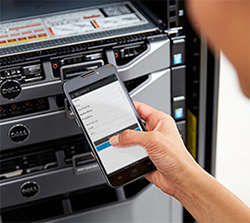 We now offer Dell PowerEdge 13th generation servers with iDrac 8 Enterprise. This line comes with several designs and firmware improvements that will boost the performance of your dedicated server. All Dell dedicated servers that we offer are integrated with Dell Remote Access Controller (iDRAC) including life cycle controller. This helps you to deploy, update en monitor your server from everywhere. The Dell iDRAC with Lifecycle Controller requires no operating system or hypervisor to work. Please take a look at the overview below to see our new Dell Self-managed dedicated servers.